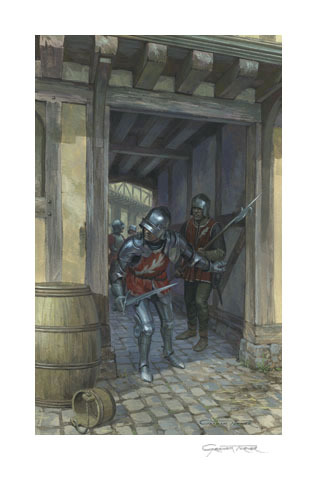 Soldiers in the Earl of Warwick's service advance through the back streets and alleys of St. Albans, to launch a surprise attack on Henry VI's forces in the market square during the Battle of St. Albans, 1455. 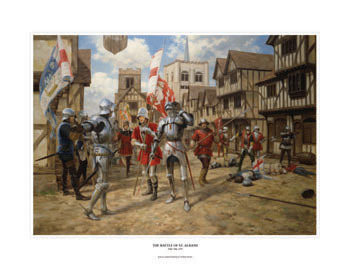 Giclée Print published from an original painting by Graham Turner. CLICK HERE for more information about Giclée Prints, which are individually printed on very high quality paper by the artist, Graham Turner, ensuring a print that is as close to the original painting as possible. CLICK HERE FOR DETAILS of the original painting 'Concealed Attack'.